Our Bodacious Dog Mom Life: What Did Lobo Request For His 4 Year Gotcha Day Gift? What Did Lobo Request For His 4 Year Gotcha Day Gift? We're almost all the way through the first month of the new year. So far, it's been a mix of great stuff, challenges, and finishing up some small projects around our home. We've kept busy. The challenging part has been dealing with the cold flu plague that made its way into our home over 2 weeks ago. Lisa is almost completely better. I'm still battling congestion. But, the show must go on. And, that includes celebrating Lobo's 4 Year Gotcha Day tomorrow. When we celebrate our kid's Gotcha Days, they get several things. The first, a gift. The second, the dinner of their choice to share. The third, a dessert of their choice to share. Out of all of our kids, Lobo's requests for Gotcha Day gifts have been elaborate. He teeters on being high maintenance. A couple of years ago, he wanted a nappy nook to share with his siblings. We complied. You can see the before and after of our entertainment stand that we converted into a DIY Dog Nappy Nook here. Last year, Lobo wanted a DIY Indoor Dog House to share with his siblings. That also happened. You can check that out here. This year, I needed to have THE TALK with Lobo. We have officially run out of floor space for DIY Dog Beds and DIY Indoor Dog Houses and DIY Dog Nappy Nooks. Last year, Sophie wanted a DIY Dog Bed for the Bodacious DIY Dog Mom Project Workshop. That was the last room. "Okay, Lobo. We are out of floor space. Every room in our home has at least 1 DIY dog bed, indoor dog house, nappy nook, etc." "What does that mean, Mommy?" "It means that you and your siblings need to be creative when thinking of gifts that you'd like for your Gotcha Days." "The bathroom doesn't have a dog bed, Mommy." "We're not putting a dog bed in the bathroom, Lobo." Lobo thought long and hard. "Okay, I know what I want." Lobo gave me a couple of juicy kisses. 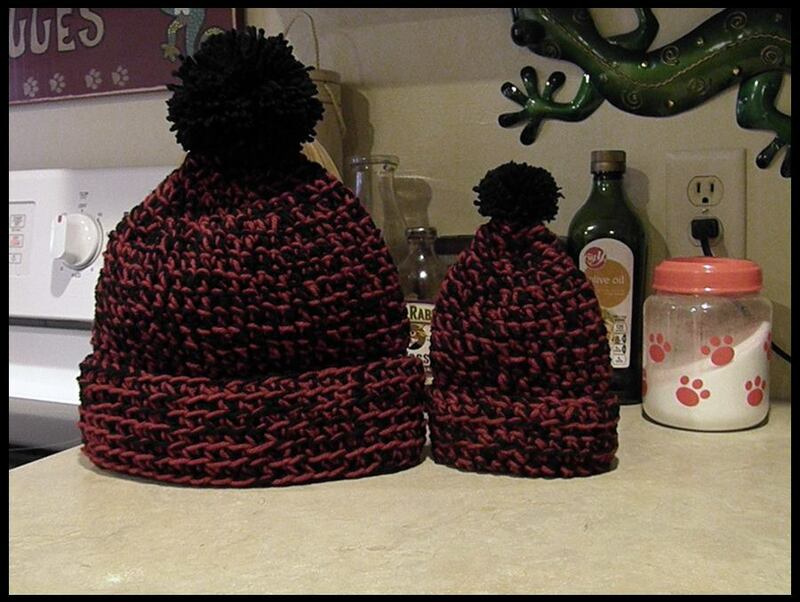 "Remember the hat you crocheted my other Mommy last month?" "I want a matching one. I'd like a matching scarf too. Then, you can take a picture of us wearing our matching hats." "That sounds like a great idea." "I'd also like it if you made the meatballs that Coco, Sophie, Willa and I love." "I'd also like shrimp to go with them." "And, for dessert, can you make my favorite peanut butter cheesecake cupcakes?" "Thank you, Mommy. You're the best. I love you." "I love you too, Lobo..."
This afternoon, I finished the matching hat. I started crocheting his scarf. Tomorrow, I'll be spending a lot of time in the kitchen.